I am the first to admit I have very eclectic interests when it comes to reading. There is absolutely no telling what might show up next on my review shelf. What is odd though is that I rarely read non-fiction and my last two books in a row were….uh-huh. Sometimes I am very amused with how my books line up. The Haida Gwaii Lesson by Mark Dowie appealed to me as I have an interest in Native American issues. 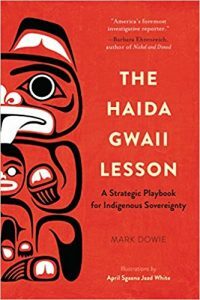 In The Haida Gwaii Lesson, former University of California journalism professor and Mother Jones editor Mark Dowie shares the story of the Haida people, relating their struggle for sovereignty and title over their ancient homeland as a strategic playbook for other indigenous peoples. For over 10,000 years, the Haida people thrived on a rugged and fecund archipelago south of Alaska, which they called Haida Gwaii. Nicknamed “the Galapagos of the North,” the islands are blessed with a diversity of species unmatched in the northern hemisphere. As western Canada was settled by Europeans, the pressure on natural resources spread with the growing population and its demand for fur, fish, minerals and lumber. Industries found their way to the coastal islands, where they ignored native tribes and commenced what has become one the Pacific coast’s most monstrous natural resource extraction campaigns. After almost a century of non-stop exploitation, the Haida people said “enough” and began to resist. Their audacious four-decade struggle involving the courts, human blockades, public testimony and the media became a living object lesson for communities in the same situation the world over. Mark Dowie recently retired from the University of California Berkeley Graduate School of Journalism, where he taught science, environmental reporting, and foreign correspondence. Previously, he was Editor-at-large of InterNation, a transnational feature syndicate based in Paris, and before that a publisher and editor of Mother Jones magazine. He is the author of seven other books. OK. This is, granted not a book that is going to appeal to everyone. While it is not something that often shows up on the blog I have long had a passion for anthropological issues and Native American history so this book certainly piqued my interest. It’s been a bit since I sat in my college classes (ah-hem) and I am no scholar but that does not mean a title can’t be accessible to some schlub sitting in a yurt in Montana. If you have the slightest interest in Native sovereignty or Native issues do not be afraid that this book will be written like a textbook. It is not. Mr. Dowie presents the material in a remarkably down to earth manner. I actually found myself turning the pages as if I were reading a fiction book anxious to reach the ending. He breaks down complicated issues into eminently readable chapters about how the Haida Gwaii started, thrived, were decimated by smallpox, recovered and then one day were told they were citizens of Canada whether they liked it or not. There are chapters at the front of the book and at the end of the book that deal solely with the history of the Haida Gwaii peoples and then how they fought for their sovereignty. In the middle of those chapters is a primer on the European conquest of well, the world and how they treated the Native populations they encountered. I was particularly fond (not) of the tale of the Spanish landing in what is now South America, loudly proclaiming their intentions to those they met and then killing them for not immediately answering back in a language they neither understood nor spoke. The book certainly makes you want to go back and revisit what you learned in high school because if you are like me you will come out after reading this book feeling a little bit disgusted with well, let’s just call it Manifest Destiny. None of this can effectively be righted but we can at the least read our history with a little more honesty. OK – off of the soapbox and back to the book. It certainly left me with feelings of hope for other First Peoples. The Haida Gwaii are willing share their efforts to achieve what some of them never really thought they had lost in the first place. But when a nation tells you that your land is now under its dominion and you must now do things a certain way, issues are going to arise. The people who worked tirelessly for years to allow for a level of sovereignty, if not independence do not want acclaim, in fact they didn’t want personal notoriety, only to be part of a whole nation – sovereign. It’s a very interesting book. I read it over the course of three evenings. It has given me a lot to think about. It’s well footnoted, lots of appendices and there are several other books I’ll be looking to acquire for later reading.